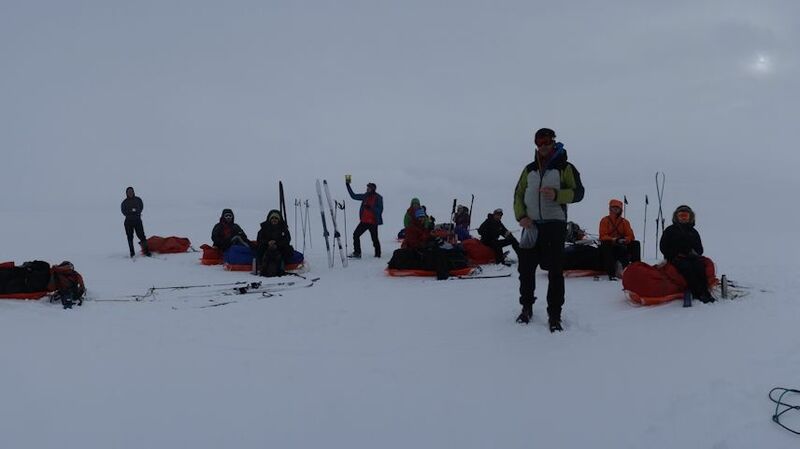 Training completed: crossing Iceland north to south via the Sprengisandur route – done. 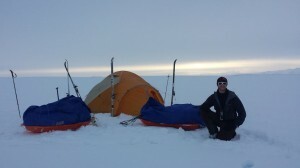 This was definitely the most physically demanding trip I have done. Iceland put on a great show too with some spectacular scenery and (literally) a couple of sunny days at the end which were simply beautiful, the ground scintillating like it was covered in diamonds. This soft side and beauty was only shown though after making us run the gauntlet and getting a taste of the beast, and that beast being the most extreme weather I have ever experienced (cue 80-90km/hr winds and snow storms!). But let me take you back to the beginning and give you a little insight into the trip overall…. 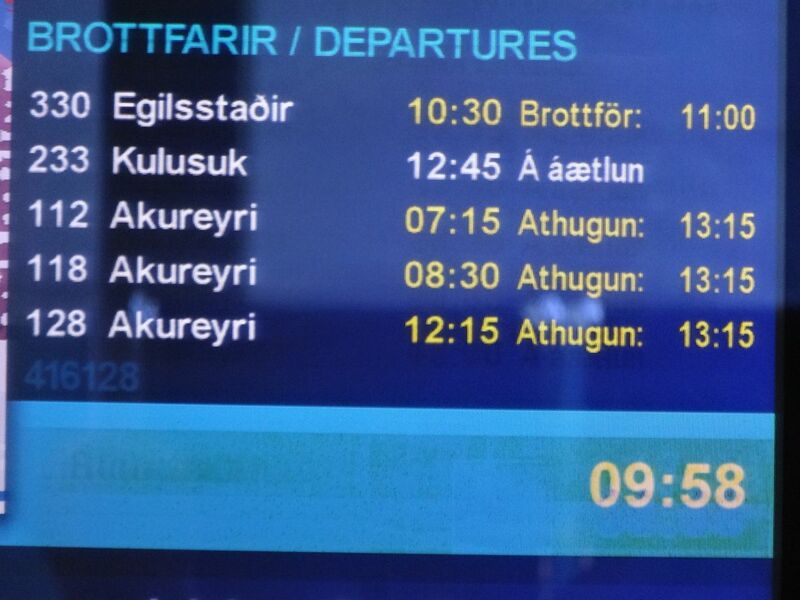 On the morning of Thursday 20th of March, after getting up at 05:30 for a transfer to the domestic airport to fly from Reykjavik to Akureyri in the north we were to find our flight delayed due to severe weather. 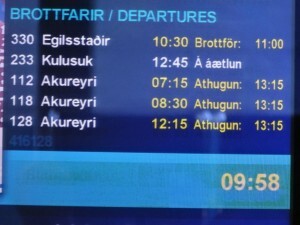 Departure moved from 07:15 to 10:15, then 13:15, then 15:15… In the end we all left the airport for lunch back in town where I had a rather tasty sheeps head jelly dish, then we headed to the Snorri Hostel and waited for the final airport update at 19:20, which would tell us if were flying today at all. I bet my friend Rémi we would fly, he bet we wouldn't, the loser had to buy the other a drink. Something I was happy to lose….and as luck would have it I did! A small gap in the weather was coming up and we were to take off within the hour. Back to the airport we rushed and jumped on the plane which thankfully did actually take off. Talk about a bumpy ride though, if this was the 'window of opportunity' I'd hate to think what it would have been like earlier. 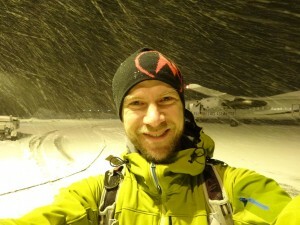 Around 40mins later we started to descend and landed in a snow storm. I couldn't see any of the landing gear from my window seat along the wing, and I'll admit I was surprised by how soft the landing was in the end despite being thrown around in the air. The main thing was we had finally arrived. Unfortunately the next day one of the trucks with some of our kit was delayed because the pass wasn't open, so we were stuck in Akureyri for another night. Eventually though everything fell into place, our equipment arrived, we packed up our sleds and started trekking. The Team: first and foremost we had an AWESOME group of people and great guides. The group was made up of some pretty seasoned adventurers with many interesting tales to tell, and we all shared so many good laughs along the way too. It was great to see everyone helping each other and come together as a team so quickly as well – be it battling rolling sleds on a mountain traverse, rebuilding snow walls during storms or collecting empty flasks for refilling. Strength & Endurance: My pre-training paid dividends and I am very glad I put the effort and time in. After the first couple of days my body responded and adapted well to the physicality of the journey and stress it was put under, and I am feeling a lot more comfortable (confident?) I will be able to step up to the mark with the greater load and demands Greenland will ask of me. Equipment: I managed to try out most of my kit and have only a few tweaks to make before setting off again. My new best friend is the Rab Strata Hoodie, which I was kindly given the opportunity to test by Snow & Rock Covent Garden before deciding to buy one, which indeed I am. I become quite hot when I exercise, and as 'active shells' go this is such a great piece of kit for me in this environment. Really good wicking and breathability whilst still insulating at the same time, even during the harshest of conditions (sorry my dear Arc'teryx Gamma Hoodie, you are now no.2 on the speed dial 🙁 ). Another piece that took me by surprise was the wool Ortovox mitts I bought – seriously, I really didn't expect them to work as well as they did, even without a Gore-Tex shell and ice forming on them during blizzard conditions my fingers were still nice and toasty with only a medium weight liner underneath. As you can guess by the photo my feet didn't finish in the best of shape, my right foot in particular. Safe to say I had some blisters that were baaaaaad. It was not the prettiest of sights when I removed the second skin patches from the inside of my ankle. Deeeeep blister and bruising, bit weepy, skin gone… Not looking too peachy in general, and bad enough that my specialist 'Dr Rémi' took a step back upon seeing it and told me to go straight to hospital. A short taxi ride later and a nurse at the emergency ward was cutting and cleaning away, after which the doctor dropped by and took a look before having me bandaged up. 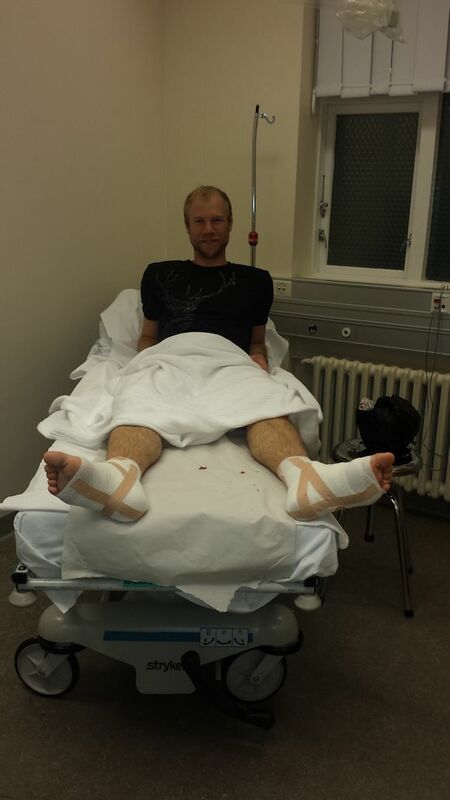 It is a slight set back to the condition I wanted to be in for Greenland but it is not all doom and gloom. 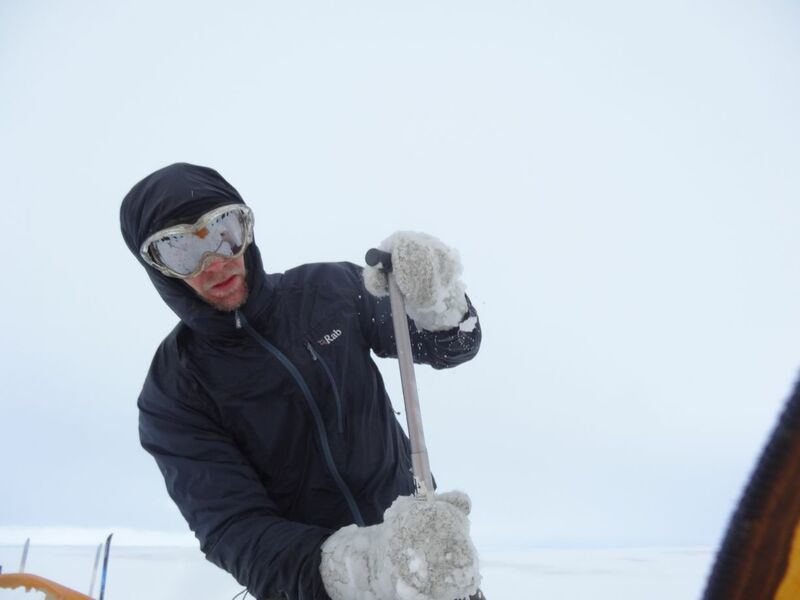 The doctor says it will heal well enough for me to manage Greenland as long as I treat it good, but it will obviously be harder going now and I will have to be extra careful. Cheers Rob 🙂 fingers crossed I can replicate the effort for Greenland.